Consequently, there are many reasons to visit the capital of the Czech Republic, like seeing the Old Town Square, the Prague Castle, or the Charles Bridge. However, Prague is also famous for its booze. The first association is, of course, beer. The Czechs brew and drink plenty of it. As a matter of fact, nobody drinks more of it than them on a per capita basis. Lager is the most widely available, but more on that a bit later. You also have excellent local wines and a great cocktail scene. There are plenty of drinks available and most of them share one trait – they are very reasonably priced. This is particularly true for the beer as you can get a good one for two Euros or less. Now that you know what’s on offer, you need to know the locations. In Prague, you can get something to drink on almost every corner. Pubs are nearly countless, you can go to breweries for the traditional beers or to microbreweries for crafts. There are also wine bars and cocktail bars if you’re in the mood for something that packs a stronger punch. Drinking establishments are so numerous that it can get a bit overwhelming. Therefore, it’s always good to know the best places to drink in Prague in advance. The following list is here precisely for that reason. We’ve already mentioned that the Czech Republic is globally renowned for its beer and that the people certainly enjoy partaking in their country’s best-known product, topping the global per-capita chart. Therefore, if you’ve decided to visit this country, and particularly if you’re in Prague, you would be doing yourself a tremendous disservice by not sampling at least some of the local offerings. In terms of popularity, lager is by far the most-brewed beer in the Czech Republic. It can be light and dark and both versions come in different strengths. One thing to note is that you won’t always be able to find the alcohol percentage. Frequently, you will see a number that symbolizes degrees. 8° is roughly equivalent to 3.5% alcohol and each additional degree equates to approximately another 0.5%. When it comes to the brands, the most popular by far is Pilsner Urquell. There also won’t be any shortages of Staropramen, Budweiser Budvar, and many others. Now, if there is one thing you won’t have a problem finding in Prague, that would be the places to enjoy some beer. However, if you want to take the connoisseur approach, your best bet is to visit a brewery. That way, not only will you get to taste the best beer, since they brew it on site and there is no transportation, but you’ll also learn a bit about the process and maybe appreciate it more. U Fleků is a very popular spot for locals and tourists alike. The brewery has been operating without interruption for more than 500 years and it specializes in dark lager, which is the only beer on the menu. U Fleků hosts organized tours and you can find it in the centre of Prague, which makes getting there easy. It has eight beer halls and a garden, which can seat over 1200 guests, guaranteeing a lively atmosphere. Also known as Klasterni Pivovar, you can find this brewery close to the Prague Castle. Many monastic orders are no strangers to the beer-making process and this brewery has been doing it with great success since the end of the 13th century. Their beer menu is seasonal, which gives you another reason to visit more than once. While the lager is practically synonymous with Czech beer, it is not the only thing on offer. In recent years, many microbreweries have popped up and they provide a wide selection of different tastes to appease any palate. Once you’ve had your fill of the traditional varieties, you can expand your search for the best beer in Prague to some of the following spots. Pivovarský dům has been around since 1998 and features both a restaurant and a pub. The main attractions are the craft beers and you can always find at least eight different kinds. From the more classic lagers to special offers like coffee beer, banana beer, beer champagne, and many more. The restaurant serves traditional Czech cuisine so you can have some goulash or roast pork to go with your beer. It’s near Charles Square so it’s easy to find. If you are really intent on getting a very nice meal to go with your craft beer, then Nota Bene might be your best choice. They have plenty of beers on tap, all brewed locally by microbreweries. The food is outstanding and diverse and you can get some very modern dishes if you choose to. On the downside, their kitchen is not the fastest in the world but that just gives you more time to try the different beers. You can find T-Anker by taking a lift to the roof of OD Kotva, a department store. This location, right in the heart of the city, gives you an outstanding opportunity to take in the spectacular views of Prague, specifically the Old Town. But you are primarily here for the beer and T-Anker offers a very broad selection. Nine beers on tap and over 40 bottled varieties ensure you have plenty to choose from. The food is not on the level of Nota Bene but they do offer plenty of grilled dishes and you can never go wrong with beer and barbecue. Zlý Časy takes a bit of effort to get to as you have to visit Prague’s fourth district. Still, that doesn’t prevent many of its patrons from referring to it as the centre of the local beer culture. And it is precisely those guests who are to thank for this establishment’s great atmosphere. Dozens of craft beers on draft and even more in bottles ensure this place is heaven for any beer aficionado. Their pub food may not be the greatest, but their beer menu is very tough to beat. Everyone’s heard of Czech beer but that doesn’t mean Prague is a one-trick pony in the drinks department. Cocktail bars are a very common sight and they offer a significantly different experience to what you would get in a beer garden, for example. Therefore, if you want a flawless martini to live out your James Bond fantasies, you’ll have no problem finding one. But you can also go for something more local. “Beton” (meaning concrete in Czech) is a popular cocktail you get by mixing Becherovka and tonic water, hence the name. Becherovka is a traditional herbal bitters and the basis for quite a few signature cocktails. If this piques your interest, the following bars are a must-see. This is, without a doubt, one of the most popular bars in Prague. That’s why getting in can be tricky. It is the place in Prague for rum and absinthe. Of course, the cocktails are amazing and the knowledgeable bartenders will give you all the help and recommendations you need. But, bear in mind that the bar has an explicit list of rules and they are enforced. You are likely to notice this bar even if you’re not looking for it. It’s right in the middle of Old Town and you can recognize it by the crowds. The atmosphere is much more upbeat compared to the Hemingway and it can sometimes even feel a bit too busy. Still, the cocktails are great and you’re guaranteed to have a good time. Just be sure to make reservations. You can find Parlour at Wenceslas Square, though it may take a bit of effort. It is small and tucked away, but worth it. Jazz music provides the backdrop for a contemplative atmosphere and makes Parlour a great place to counteract the hustle and bustle associated with many other establishments. So, if you’re looking for a loud music bar, look elsewhere. They also offer very clean cocktails, without lemons or cherries and similar ingredients, fitting the reserved ambiance. Czech wines are overshadowed by the beer, which is a shame. Although not as well-known, they are quite good and there are many wineries to provide you with plenty of options. For example, Kerner is a sweet white wine with a nice floral aroma. On the other hand, Cabernet Moravia is a red with an interesting mixture of spicy notes and fruitiness. You can try these, and many other wines, in one of Prague’s wine bars. This bar actually has three locations in Prague and they all feature an amazing selection of wines. Initially, the focus was on Czech brands but they have since expanded. You can enjoy a tasting session or have some cheese and meat to round off the experience. Located in the Karlin District, Veltlin offers a unique selection of wines which come from the territories that used to be part of the Austro-Hungarian Empire. Wood dominates the décor and creates a pleasant atmosphere. You can always get a recommendation from a helpful sommelier and there are frequent special events. Within walking distance of Bethlehem Square, you can find Red Pif (“red nose”). Concrete is the highlight of its interior decoration and provides a minimalist feel. They focus on French wines, but also have certain Czech varieties on offer. To complement the wine, they have a full kitchen with a small, but carefully selected, menu. Now that you’ve read a bit about some of the absolute best places to drink in Prague, it should be clear that the capital of the Czech Republic has plenty more to offer than just beer. Although you should never pass up the opportunity to try one, particularly if you haven’t had that brand before. 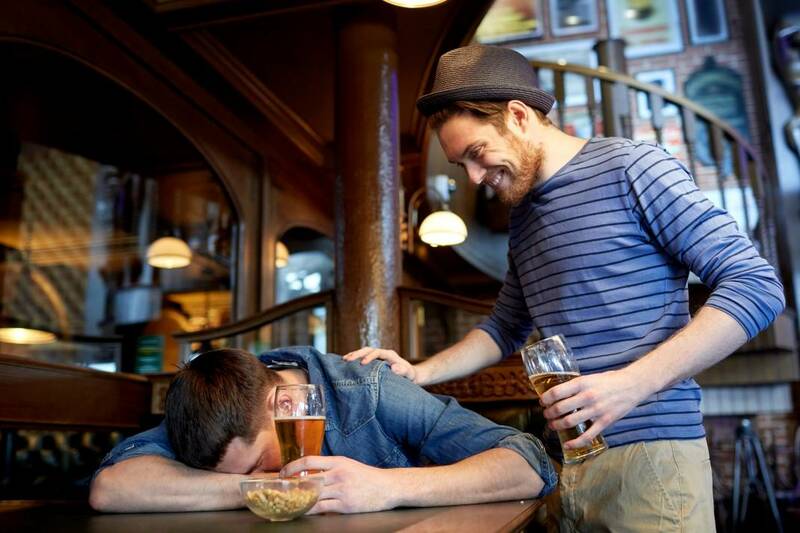 As a final remark, you will find a couple of tips that should help you navigate all manners of drinking establishments in Prague. For one, bring cash, just to be on the safe side. You don’t want to end up in a place that doesn’t accept cards after you’ve already had your fill. Secondly, make sure you have Czech korunas (or crowns), as that is the official currency. It’s not the Euro, as some may believe. Some establishments accept it, but why take the risk? Next up, try and make reservations whenever you can as the more popular spots can get crowded in a hurry. Finally, once you’re done drinking, you will want to leave a tip. It’s not mandatory but most places expect it. For larger bills, you can go to about 10%. For smaller sums, just round it up to the nearest 10 or so. The only thing left is to enjoy yourself. Prague is a wonderful city in many regards but if you enjoy a nice drink, then you’re in for a treat of a lifetime.